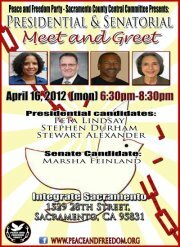 Peace and Freedom Party Sacramento CCC will host a meet and greet with three of our Presidential candidates; Stewart Alexander, Stephen Durham and Peta Lindsay and U.S. Senate candidate Marsha Feinland. Rocky Anderson had also been and is invited but unfortunately, he will be in Salt Lake City, Utah. Also, Kabiruddin Karim Ali was invited but will be in southern California.